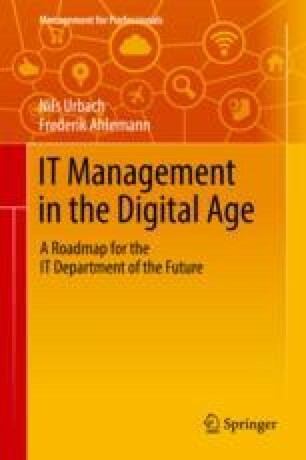 Due to the trend towards digitalization that is described in the previous chapter, it is crucial for many companies to successfully, effectively, and efficiently produce innovative business and value creation models, to develop appropriate IT solutions, and to realign their own companies in order to remain competitive. In this context, the concerned IT departments are called upon to play a proactive role in the innovation process and to accompany, or even drive, the changes regarding the necessary IT support. At present, however, the majority of IT departments do not yet fulfill this role completely, because they—as reactive service providers—often do not have the structures, processes, or skills to systematically develop (business) innovations. Furthermore, IT departments are often perceived as bureaucratic, inflexible, and not on an equal footing with the business departments. For example, in the event that business departments request short-term changes to information systems, the changes are not implemented quickly enough—from their point of view—if the IT department’s timeframe for making the changes is too long. However, in the digitalization context, the ability to quickly modify information systems is of great importance. The question that arises at this point is why it appears as if corporate IT, in many cases, is not optimally positioned for the challenges of the digital transformation. In order to answer this question, we need to give an overview of the most important development steps in corporate IT. Understanding this history, should help better determine the changes that are necessary for the digital transformation.